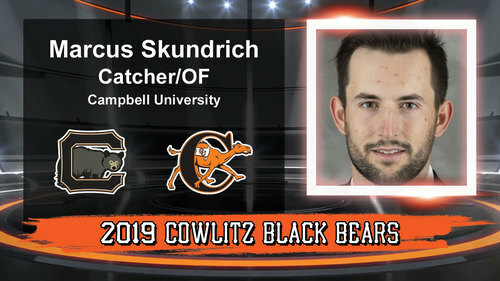 The Cowlitz Black Bears are happy to announce the signing of Campbell University junior Marcus Skundrich. A talented and versatile player for the Camels, Skundrich is primarily a catcher by trade. Yet, with his athleticism, you can find him in the outfield on any given day. Skundrich is in his first season with Coach Justin Haire’s Camels program. Skundrich played his first two seasons at Mesa Community College in Mesa, Arizona. He was a run-producing machine for the Thunderbirds and was named to the first all-conference team. "Coach Haire and I have had a relationship for years and Marcus was the first name he gave to me," said Cowlitz Coach Grady Tweit. "I am very excited to get a guy who can catch with Skundrich’s skills and the next day be in the outfield, still producing runs for us." Skundrich is from Scottsdale, Arizona, where he played and graduated from Scottsdale Christian Academy. Please welcome Marcus Skundrich to your 2019 Black Bears!